After qualifying from the Royal Free Hospital and School of Medicine in 1991, Dr Hami undertook a medical rotation followed by 2 years in Anaesthetics. 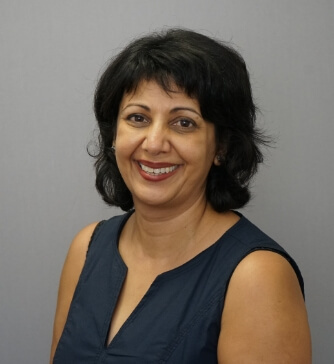 At an early stage in Dr Hami's career, the patient and carer experience was important to her, and that’s where her interest in Palliative Medicine started. She completed the North London Palliative Medicine training scheme in 2002 and was appointed as a Consultant at Buckinghamshire Healthcare NHS Trust the same year. She is the Clinical Lead for the Hospital Specialist Palliative Care Team: the team provides 24/7 palliative care advice; 7 day working; and Consultant led on call. She also sees patients in their own homes, works one day at Florence Nightingale House hospice in Aylesbury, and has a weekly outpatients clinic. She provides palliative care to the local Private Hospitals in Buckinghamshire. The CQC rated the specialist palliative care service “Good” and “Well Led” in 2017. She was the Trust Cancer Lead for 4 years, and Clinical Director for Specialist Services for 6 years until 2016. These roles gave her a good local and national perspective on the services we provide, but also made her even more determined to keep patient care at the heart of any service that she, or her team, provide. Dr Hami has a passion for supporting her colleagues to develop and grow, and believe that we are always learning. Therefore she values her roles as an Educational Supervisor, Trust Coach and Medical Appraiser.